Boxing is a very successful sport in Belfast. The sport plays an important role in our communities for both elite performers and local members. Our Amateur Boxing Strategy considers the role and development of amateur boxing in Belfast, and outlines our commitment to develop the sport. If you want to join a club or get more information on Boxing, use our Belfast Clubmark club finder and search for boxing clubs. Boxing events Everyone We're supporting County Antrim Boxing in facilitating events citywide to help develop boxers. So far we've supported seven events citywide, and we're planning to support even more events for clubs and boxers in Belfast. Schools coaching and schools clubs (non contact), plus community sessions Young people in schools and clubs We'll be developing programmes and linking children with their nearest club. Please contact us to find out how to book our boxing coaches who can provide structured sessions adapted to all ages and abilities. These sessions are free of charge. Boxing-related fitness classes in our facilities Everyone Boxing is a great way to improve your health and physical fitness. For more information please call 028 9027 0344. New boxing clubs Everyone We'll establish new boxing clubs, where there is a demand, and support current boxing clubs. Dedicated boxing coach and officials education programme People who are already involved in boxing We'll provide opportunities to support boxers and offer development opportunities to improve their performance. £1.5 million of National Lottery Funding has been secured to deliver Sport Northern Ireland’s Every Body Active 2020 Strand 1 programme. The aim of Everybody Active 2020 (EBA) is to encourage more people to be more active, more often. This funding is provided to a range of organisations including Sports Governing Bodies. A governing body who has benefited from this funding is Irish Athletic Boxing Association, they have used this to deliver a Mid-term Membership Growth Programme 2019. Through this programme they were able to support 20 clubs from across the city to deliver taster sessions during the mid-term break. Throughout the week there was a specific focus on the underrepresented groups within boxing. 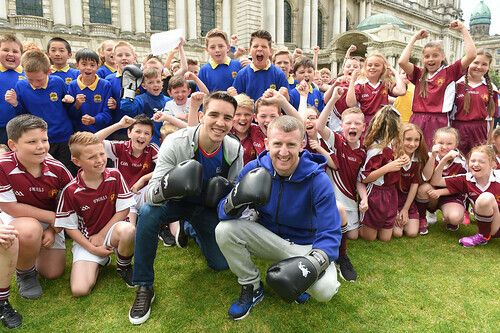 They supported 16 clubs across the city with four additional clubs supported through the Belfast Boxing Strategy. This was a brilliant success with each club reporting an increase in membership once the programmes had finished.